To prevent the confusion (for officials, players, and fans) that might result from two opposing teams wearing uniforms (kits) with similar colors, teams have different variations for "home" and "away" games, where typically one is dark and the other is light. In the four major North American sports leagues, one of the two uniforms is almost always predominantly white, and each league except for the National Basketball Association (NBA) has a rule to determine which team should normally wear its white uniform. Customarily, National Football League (NFL) and National Hockey League (NHL) teams wear their color uniforms for home games. By contrast, Major League Baseball (MLB) teams wear their white uniforms for home games. The NBA traditionally required home teams to wear white, or at least a light color, but as of the 2017–18 season allows home teams to wear any uniform color, mandating only that away teams wear a color that sufficiently contrasts with the home team's choice. These rules are not strictly enforced, however, for any of the four major professional sports leagues in North America. Some NFL teams, most notably the Dallas Cowboys, prefer to wear their white jerseys for home games. When Joe Gibbs was the head coach of the Washington Redskins — first from 1981-1992, and again from 2004-2007 — the Redskins exclusively wore white jerseys at home games. 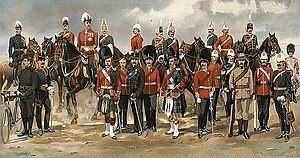 In the United Kingdom, especially in football, the terms "kit" or "strip" (as in 'football kit') are more common (instead of uniform). 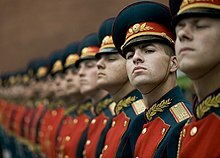 A Russian honor guard wearing their full dress uniforms. Full dress is a formal uniform typically worn in ceremonies. A uniformed police officer in Sweden. The police often wear uniforms to distinguish themselves in public. 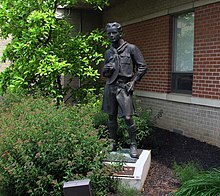 Statue of a Boy Scout in uniform. The Scout uniform is a specific characteristic of scouting used in most of their events. ^ Atkinson, Charles Francis (1911). "Uniforms" . In Chisholm, Hugh. Encyclopædia Britannica. 27 (11th ed.). Cambridge University Press. p. 582. ^ Rafaeli, A. & Pratt, M. J. 1993. Tailored meaning: On the meaning and impact of organizational dress. Academy of Management Review, 18(1): pp. 32-55. ^ Pratt, M. & Rafaeli, A. 1997. 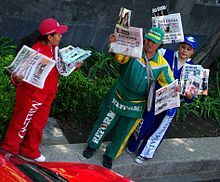 Organizational dress as a symbol of multilayered social identities. Academy of Management Journal, 40(4): pp. 862-898. ^ Pratt, M. & Rafaeli, A. 2001. Symbols as a language of organizational relationships. Research in Organizational Behavior, 23: 93-113. ^ Whitaker, Lang (July 18, 2017). "NBA, Nike unveil new uniforms for 2017-18 season". NBA.com. Retrieved October 15, 2018. ^ "White at Home in the NFL". www.uni-watch.com. Retrieved July 5, 2015. ^ Compare: Finkelman, Anita Ward; Kenner, Carole (2010). Professional Nursing Concepts: Competencies for Quality Leadership. Jones & Bartlett Publishers. ISBN 9781449617677. Retrieved 2016-11-08. Prior to the all-white uniform, the nurse's uniform was gray or blue, similar to a nun's habit and to the uniforms worn during Florence Nightingale's time [...]. ^ Peach State Button Club (2010). "Uniform (Division II)". Button Country. Georgia, USA: buttoncountry.com. Retrieved 11 March 2010. ^ HM Revenue & Customs. "SE67240 - Tax treatment of nurses: expenses deductions - laundering uniforms - amount to be deducted". Retrieved 1 November 2007. ^ Australian Taxation Office. "Claiming a deduction for laundry/dry cleaning of work clothing". Archived from the original on 27 February 2008. Retrieved 1 November 2007. This page was last edited on 27 December 2018, at 02:43 (UTC).